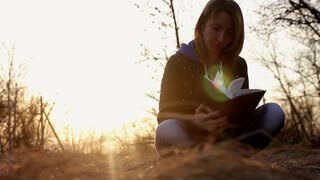 Beautiful young girl, sitting on a fallen autumn leaves in a park, reading a book, sunset light. Concept girl freelancer, working in a spring park. 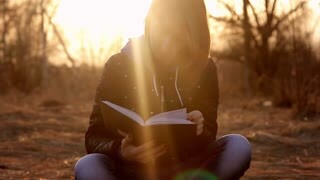 Beautiful young girl, sitting on a fallen autumn leaves in a park, reading tablet computer to take notes in a notebook, sunset light. Concept girl freelancer, working in a spring park.